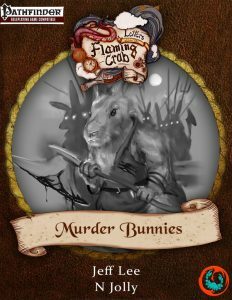 Flaming Crab Games recently compiled a letter titled “Murder Bunnies.” As soon as I heard of its impending release, I was intrigued. I mean, how (and why) would such a soft, adorable creature be linked with murder? 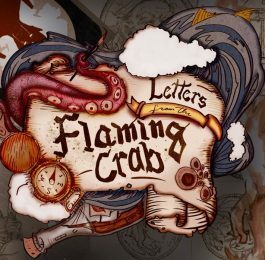 One of the things I love about Letters From the Flaming Crab is their strange and unique take on things. This company takes something overlooked, seemingly dull, or otherwise unexplored and turns it into something intriguing or thought provoking. I loved the way Hygiene raised some great points about how nail care can affect a disguise, I had my taste buds tickled with magical food in Culinary Magic, and I appreciated the exploration of banks and lending institutions in Coins and Credit. When Murder Bunnies was released, FCG offered up a few copies on Paizo, with the hopes of a review or two. As a 3PP writer, and publisher, I feel weird writing typical reviews. I know how much work goes into a product, and what people want out of a product varies. This hesitancy with reviewing FCG products is amplified by the fact that I’ve written for them, but I received a review copy, all 3PPs appreciate feedback, and well, who doesn’t want to know more about this PDF? So What About Murder Bunnies? This is a bonus letter, which means it was not one of the initial letters scheduled for release in 2016. The letters released this year have generally been longer than those compiled in 2015, and as such the price was increased slightly. Murder Bunnies is back to the lower page count (clocking in at 9 pages), and priced accordingly at $2.99. 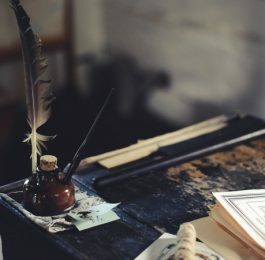 The focus of the letter was exploring the race of trius vrai, more commonly known as lepus hostili or “murder bunnies.” It opens with a note from Aldus Emberidge, a sage and advisor unfortunate enough to have been held for a time by these strange rabbit folk. I loved this. It is the stuff of the letters. 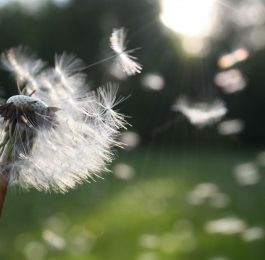 The PDF went on to detail the physical descriptions, alignment, society, relations, adventures, and all of the typical things that need to be discussed when introducing a new race. From there it features four different racial archetypes, new racial rules, including trius vrai equipment such as the abduction rope. There’s a collection of feats, some neat magical items specific to this savage and creepy race of rabbitfolk (lucky halfling foot anyone? ), and then a few spells. (Honesty here) I’m not a big lover of reading mechanics. I know: Pathfinder has a ton of rules, and they are meant to be followed, and you need the mechanics to make the game work. I get it. I get this is a letter about a race. And I was prepared for that. The archetypes use the kineticist, spiritualist, brawler and druid classes, and I appreciate the way these archetypes suit the race or trius vrai, and also use a variety of class types. The visual of the primal vessel archetype with its manifestation of the ancestral spirit of the trius vrai race is particularly cool, and a neat take on the class. But the bottom line is that I love the fun twists FCG’s puts on their letters. I love how easy it has been to incorporate the ideas from the letters into our game sessions. A bit here, a bit there, heck a whole fair ready to go. 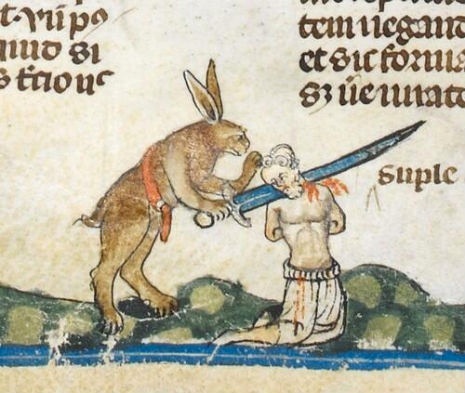 Murder Bunnies fell short. It’s “just” a race. A cool race. An interesting race. A race with potential. But it’s a race, not an easy to use/adapt/insert Letter From the Flaming Crab. It did get me thinking about some cool things to do, but I guess the bottom line is I wanted some of these ideas or springboards included. I wanted that little extra that made Letters from the Flaming Crab: Murder Bunnies easy to drop into an ongoing campaign. That made it a Letter. Your players, out venturing in unknown territory, accidentally stumble into an area inhabited by trius vrai. Grab their character sheets, hand them some premade “murder bunny” character sheets. Describe the humanoids venturing into their territory, emphasizing the way their rabid bunny blood boils and their muscles scream at the chance to bury their sharp weapons into the flesh of these trespassers, or you know, that kind of thing. Let the dice fall as they may. 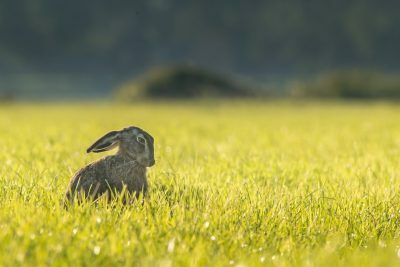 This gives your players a chance to try out this seldom seen race of rabbit folk, makes them see what it feels like when the shoe is on the other foot, and gives you a chance to peruse their character sheets. If you don’t like switching character sheets, why not set a game night or two in a village of trius vrai? Have your players make PCs with this unsociable race, send them out on guard duty and have a group of adventurers find them, and their bunny clan. A local farmer has been having trouble. He recently built a new pen for his livestock, moving them out into a field previously used to grow crops that kept disappearing. The animals were all brutally murdered, and now his young daughter insists she saw giant rabbits do it. He asks the PCs to investigate. The PCs, venturing through the woods, happen on a young, injured trius vrai. The wounded bunny creature is unlike anything they have seen before. If they offer assistance, he seems to trust them enough to accept, and in thanks, he leads them back to his home. 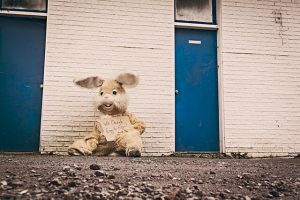 The group is welcomed well enough, but quickly the friendly farce falls away and suddenly the group is trapped inside the village of a savage rabbit folk. The trius vrai could attack openly, wait until the party is asleep, or give the PCs a chance at a game: outrun us and live. Was the injured trius vrai aware of what his people would do? And if you want something more simple, throw a fun, and different, NPC their way. He (or she) could be hiding out in the woods as a refugee or a survivor, or could be wandering the town, or there on a mission. For the full story on these not-so-cuddly creatures, you should head on over to OBS or Paizo and grab yourself a copy.